Community cats live outdoors and in and around our neighborhood. They may be feral (not socialized to humans) or friendly, may have been born into the wild, or may be lost or abandoned pets. Loudoun County is populated by hundreds of colonies of cats occupying a wide spectrum of socialization level and interactions with humans. These cats are “owned” by the community and the community is their “home.”* Most of them have caretakers that love and care for them on a daily basis and they are happy and healthy living outdoors. If you need help caring for an outdoor cat please let us know. We are here to help! Where do so many community cats come from? An outdoor cat may find its way to you, or you may find it. It is important for you to distinguish whether or not the cat belongs and lives outdoors, or is a lost or abandoned pet cat. There are different things to look for in order to make this determination and these differences will tell you the direction you take in helping the cat. A lost or abandoned pet cat has been socialized to people at some point in her life, but has left or lost her domestic home, as well as most human contact and dependence. Over time, a stray cat can become a community cat or feral, as her contact with humans dwindles. A community cat (or feral) is typically born in the wild or outdoors with little to no human interaction. They will have different levels of socialization to humans depending on where they live and the amount of contact they have had. Stray and pet cats have been conditioned to be around people, and although they may be scared or shy at first, they may approach you for food, shelter, or just attention. They may tolerate being touched or petted after a little while. Strays may also stay close to houses, porches, or places where there is activity and will usually eat immediately if food is put out. Stray cats typically stay on their own and do not socialize with other animals. A community cat has had little to no interaction with humans from an early age and will likely stay fearful and avoid all contact. Because they lack socialization they are often called "feral". They generally will not tolerate being touched, even by someone who feeds them. They may appear hungry but will only come out of hiding to eat once they're sure people aren't around. Community cats tend to stick together in a colony and socialize with each other. Stray cats will typically roam the neighborhood in the open with their tail up as a sign of friendliness. They make eye contact and may look directly at you while blinking. They may be vocal, meow, and respond to being called. When in a trap, they may hiss or growl at first. If they relax after a while they may rub against the bars or come to to the front of the cage to seek attention or investigate food and toys. Community cats are more reclusive, avoid eye contact, will crouch low to the ground and keep their tails down or tucked under them. They don't usually meow or purr. A trapped community cat usually cowers at the back of the cage and will fight to get out. They will lash out if they feel threatened and take an aggressive posture with their ears back and pupils dilated. Community cats will likely ignore toys and sometimes food they are given. Community cats are mostly nocturnal, hunting and traveling mostly by night and rarely seen out in the open during the day. Stray and lost cats are usually active during the day and can be seen in around buildings and yards looking for food and shelter. Because community cats are used to spending their whole life outdoors, they are usually healthy looking with clean, well-kept coats. When lost in an unknown area without familiar resources, strays may look thin, dirty, and disheveled. Assess the welfare of the cat. This is very important. If a cat has found you this may mean that he is looking for help and may be injured or sick. Please do not turn a blind eye. If something does not seem right, it probably is not and you should step in and help. Will the cat eat the food you are offering? Does it appear to have any injuries or an illness? Determine if the cat is a community or feral cat or a lost or abandoned pet. 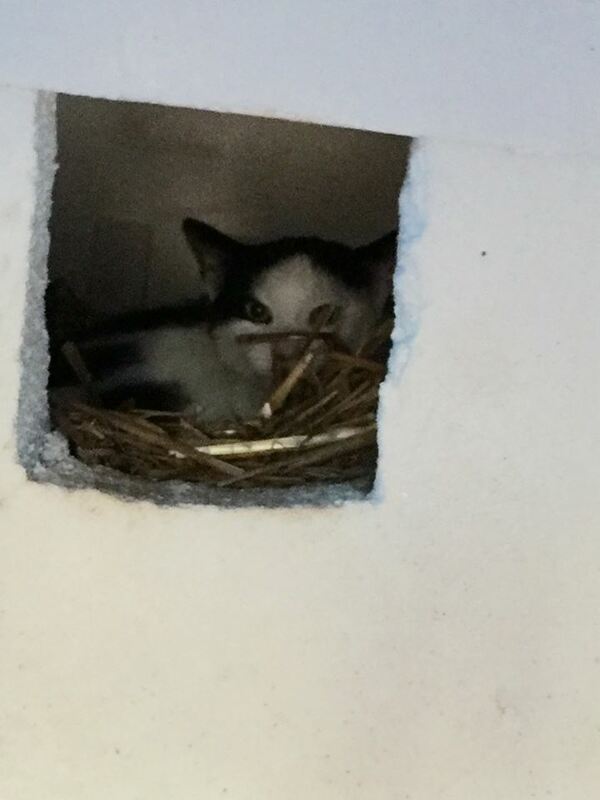 If the cat is a feral or community cat, fill out our TNR Assistance form and we will help you trap the cat to get it fixed, vaccinated and needed medical attention. If you cannot reach us and it is an emergency or the cat appears very sick or injured, please call our partner Loudoun County Animal Services at 703-777-0406. If the cat appears to be friendly, use a cat carrier and take the cat to a veterinarian so that they can scan it for a microchip and assess its health. Place a found report with Loudoun County Animal Services at 703-777-0406. Make and place flyers around the neighborhood, with local vets, and pet stores. Post on Facebook and other social media. Be sure to ask for proof of ownership such as photos or vet records with pictures before relinquishing the cat to anyone. *The National Animal Control Association (NACA) recognizes community cats as an integral component of the overall cat population and promotes the development of comprehensive management practices that encompass both owned and community cats (NACA 2008).